National Jewish Health's research and charity care are very important to Jack Hersh. Jack Hersh of California has always been a problem solver. For more than 50 years, he traveled the world, overseeing repairs to damaged airplanes and making them airworthy again. When he saw a problem with the cost of health care, he set out to contribute to a solution. "I was in the hospital for a fractured ankle during the time when Silicon Valley folded up in the 1990s. So many young people who were just starting out lost their jobs," recalls Jack. "It was very expensive for just a few days of care for me, and I wondered what happens to people who lose their insurance and their jobs? How do they take care of themselves and their families when they have conditions like asthma and cancer?" Jack investigated hospitals that provide charity care and that also conduct medical research. He landed on National Jewish Health, which fit both of his criteria. Since its inception in 1899, National Jewish Health has been devoted to providing care to patients, regardless of age, race, religion or ability to pay. In these challenging economic times, our commitment to serving those who can't afford to pay is more critical than ever. We are also a world leader in the research and care of respiratory, cardiac, immune and related conditions. Our concentrated efforts, decade after decade, have enabled us to advance the course of medicine for tuberculosis, asthma, interstitial lung disease, lung cancer, immunology and allergies. 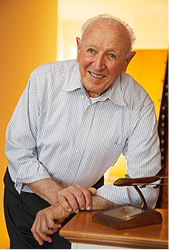 For more than two decades, Jack has been a donor to National Jewish Health. In addition to his annual giving, he decided to support the future of the institution through a gift in his will. "I was in a position where I could do some good, and my relationship with the hospital just grew from there," he says. "I support the hospital because of the focus on research and charity care. Even though families can't afford it, they still treat them." Contact Gordon Smith, MBA, CFRE at 1.800.423.8891, Ext. 6549 or giftplanning@njhealth.org today to learn how you too can plan a gift that will support world-class research and care.